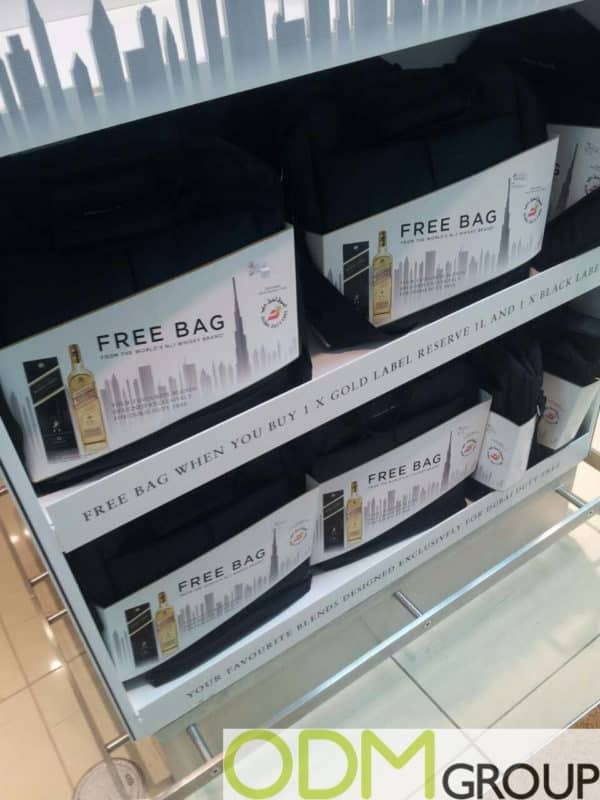 One of the most famous whiskey makers Johnny Walker are currently offering promo bag as a free gift with purchase in Dubai International Airport. According to the promo campaign conditions customers need to buy 1 bottle of Gold Label Reserve and 1 bottle of Black Label Reserve. Gold Label Reserve and Black Label Reserve are good examples of elite whiskey which can be a good gift for alcohol connoisseurs. In this case gift with purchase promo campaign adds even more value to the product. Why is this promo bag by Johnny Walker effective for drinks marketing? Practically. First when customers get something like promo bag, pouch or wallet, they can use it immediately. In this situation with Johnny Walker whiskey customers can put bottles into this promo bag, because it is more convenient to carry and safer then using plastic or paper bag. Therefore customers will not be worried about their purchases. High-quality gift. Due to using high-end materials for this promotional item, it becomes very durable and can be used for years. In this case Johnny Walker gets free brand reminder even when a whiskey is drunk. Besides giving such a qualitative promo product companies can increase the brand value and retain customers. Additional customers. If you offer a gift with purchase, your brand will attract more customers than other companies in the same industry. This great promo idea makes your brand more competitive and will motivate customers to impulsive buy. Also sometimes it is too difficult to choose drink for someone who doesn’t really get outside of beverages. As a result they would like to choose the best offering. So this whiskey with promotional bag is the best offering for this type of clients because they get something more than just a drink. If you planning your new marketing budget we would like to offer you a lot of great promotional ideas. Here at the ODM Group we have a huge sourcing, designing and manufacturing experience and can provide you with professional assistance in you next promotional campaign. Please feel free to contact us today to get more information.